Rated 4 out of 5 by Glenn from Worked Great! Bought for hurricane Irma. We were without power for 12 days, our RS 5500 supplied us power that enabled us to run a room air conditioner around the clock as well as lights, microwave, (2) refrigerators and much more. I would fill the fuel tank up before bed and then fill it again in the morning when I started my day. We ran our unit practically 24 hrs a day around the clock and had absolutely no issues. The one problem I have is the fuel gauge window has changed from clear to very dark and discolored making it difficult to read. I am going to contact Generac and request a replacement. Rated 4 out of 5 by oldebay from auto idle does this model have auto idle feature? need to know before purchasing. thanks. what's the next model up or down in watts that has auto idle if this one doesn't? Rated 2 out of 5 by bigdawgfan from well........... I've had this generator for 2 years. It got a pretty good workout after hurricane irma hit.Ran like a champ. It has 77 hrs on it and the fuel gauge has started to leak. 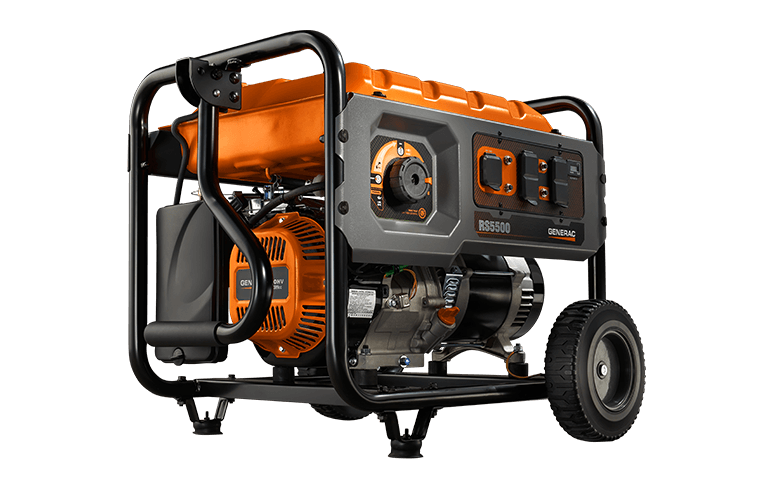 I contacted generac to order a new one and was told it was on backorder and that they have no idea when it will be available. Which is nice....... $8 part holding up $800 generator. Guess i'll have to do a little redneck engineering on it to stop the leak since generac didn't offer up any solutions. No more generacs for me. Rated 5 out of 5 by BillyBob from Top quality product with great features. Bought after Hurricane Florence when my older generator broke down. Easy to operate and fulfilled all my needs. RS5500 is rated 4.7 out of 5 by 118.